So, I've run into a bit of a problem. I just recorded a few episodes of an LP series, with roughly 20 minutes of footage each. On a separate computer, I recorded my commentary via Audacity. It's the setup I've used for ages, and it's never given me any problems. However, I recently switched over to the BandiCam Premiere preset, so it's easier to edit, and I'm running into some serious audio drift. It starts off synced, then slowly deviates as the video continues, and is completely out of sync within a few minutes. I've checked, and I made sure both the audio and the video were running at 48000, so the sample rate shouldn't be an issue. I've tried everything I know of - re-exporting the video with a different Codec, re-exporting the audio at 44100 - and nothing seems to work. It's strange - I've never had any sort of trouble like this until I switched to the Premiere preset, and now it's all out of whack. I've attached my Bandicam settings, though the only difference between it and the preset is that I bumped the quality up to 90 instead of 80. Uncheck "Skip recording while frame is not updated", and try it again. If you uncheck this option, Bandicam will record even though the frame is not updated/refreshed. I am also having this issue where the audio just randomly drifts. did all the above. Also with multi tracks and webcam + desktop recording one clip is always a bit longer than the other. Which recording mode are you using? What is your recording target? 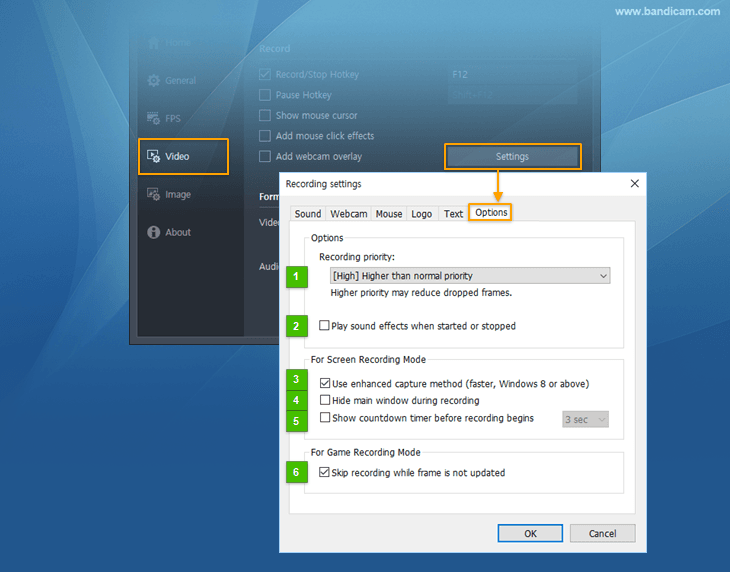 Please let us know your format settings and how to recreate the issue. My issue. I record all my files on their own track. Webcam clip will always be slightly shorter than game recording, we are talking like 1/2 second difference. I manually will sync the audio by clapping on cam and lining it up with the audio and eventually it drifts off. The webcam overlay function usually delay and the difference of 0.5 second in duration time is normal. Please use an editing software after recording with "Save webcam video as separate file (.mp4)" option enabled. I appreciate the response, however, I already claimed that everything I record is separate..
My issue is the audio drifts out of sync even with the clips being the same length.